President of Turkmenistan Gurbanguly Berdimuhamedov held talks in Ashgabat with President of Azerbaijan Ilham Aliyev, who arrived in Turkmenistan on an official visit. The one-on-one meeting between the heads of state was followed by the talks in an enlarged format with participation of the two delegations. The sides discussed issues related to increasing interaction in the political, trade and economic, energy, and transport, cultural and humanitarian spheres. The sides held a detailed discussion of issues related to the Caspian Sea. The sides also exchanged views on the current regional and international issues of mutual interest. The talks concluded with the ceremony of signing bilateral documents. The sides signed agreements on transport and transit issues, on exchanging preliminary information on goods and vehicles moving between the two countries, on simplification of the visa regime for international traffic participants in the territories of the two countries, on development of maritime commercial shipping, on automated information exchange between the sea ports of Turkmenbashi and Baku, on increasing cargo transshipment between the sea ports of Turkmenbashi and Baku, on development of international maritime transport passing through the ports of the two countries, on development of international road transport, on cooperation in the field of industry, on long-term trade and economic cooperation, on promotion and mutual protection of investments, on elimination of double taxation, on establishment of the Turkmen-Azerbaijani joint commission on transport, transit and logistics. 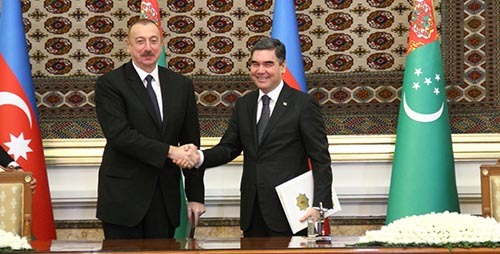 The sides also signed the Memorandum of Understanding between the Institute of International Relations of the Ministry of Foreign Affairs of Turkmenistan and the Diplomatic Academy of the Ministry of Foreign Affairs of Azerbaijan, the Program of Cooperation in Transport for 2019-2022, the Program of Trade and Economic Cooperation for 2019-2021 and other documents. To the applause of the ceremony participants, President Gurbanguly Berdimuhamedov and President Ilham Aliyev signed a Joint Statement. Then, the heads of state made statements for press. Later, the President of Turkmenistan hosted an official reception in honor of the distinguished guest, at which the heads of states exchanged speeches. Upon completion of the program of his official visit to Turkmenistan, the President of Azerbaijan left home from the Ashgabat International Airport.